A noted chef lures fans of simple French cuisine to the Central West End. : Brunch may be an American institution, but it’s the perfect meal to show off the French touches at Gerard Craft’s Brasserie by Niche --- expect the likes of such classics as beignets, quiche and eggs en cocotte. 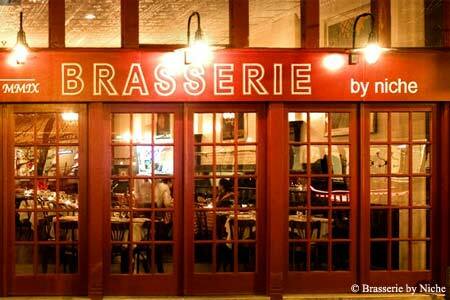 Meanwhile, the dinner menu offers spot-on renditions of bistro-style steak frites, onion soup and croque madame. The menus stays approachable by avoiding French terms unless there’s not an English translation (for example, in the case of cassoulet with duck confit, tomato, sausage and white beans) or the French name just sounds better (tender, wild Burgundy escargots). Early diners sometimes snap up all the day’s specials on the menu du jour, which is where the kitchen's creativity edges out the traditional approach. Not that there’s anything wrong with tradition, as the dessert menu proves with its profiteroles and crème brûlée. Wines tend to be French, though North American selections that pair well with the cuisine are available, too. The European-influenced cocktails include seasonal specials well worth sampling.